Browsing through this book was like being back in introductory pastry school, but scaled way up. While the instructions are thorough and the photo-by-photo illustrations certainly helpful, this book is overwhelming in it's complexity, especially for someone who perhaps decorates two or three cakes a year for family and friends. The book covers cake shaping and filling as well as fondant techniques, which are interesting and something I would want to be able to do - but the techniques are so involved that I personally felt that hands-on instruction would be needed before I dared to try them at home. However, for those people either in, or contemplating, a pastry or cake decorating course, I highly suggest this book as a supplementary text, as it reinforces the lessons most programs teach. The book's greatest strength is it's use of photography. Each page is full of full-coloured shots that generally illustrate key points or techniques, although there are some pages where the images are superfluous and somewhat dated. The passion for photography is no wonder, as the author's website is essentially a photography portfolio and states that her projects include working with photographers, advertising agencies and media companies. While the basics of cake decorating don't really change, I would have been interested to see some of the newer trends covered as well (i.e. Russian tips, ombre). I did thoroughly appreciate the "Basic Recipes and Helpful Hints" chapter, particularly the charts to help you calculate how much fondant / marzipan and royal icing you would require for a certain size cake, as well as the portion guide. The templates are adorable, and would undoubtedly be useful for those unsure about their skills or who are attempting more intricate designs. 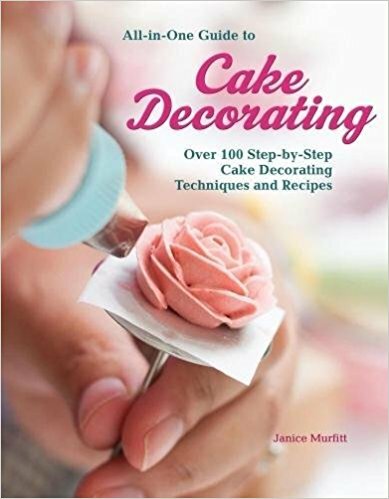 Overall, if you are serious about getting into the world of cake decorating, Janice Murfitt's book All-in-One Guide to Cake Decorating: Over 100 Step-by-Step Cake Decorating Techniques and Recipes is a good place to start, and pairs well with "in person" instruction. However, for the everyday baker, it is more of a coffee-table novelty than an instruction manual.